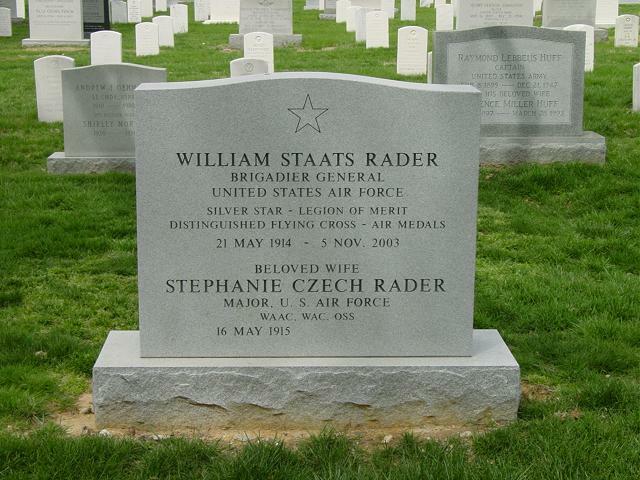 William S. Rader, 89, an Air Force Brigadier General who flew missions over Europe and the Pacific during World War II, died of cardiac arrest November 5, 2003, at his home in Alexandria, where he had lived for 35 years. General Rader flew 17 reconnaissance flights over the Pacific during the Battle of Midway. He and his crew ditched their damaged plane 100 miles from Hawaii and clung to a half-inflated life raft in 30-foot seas for 18 hours before rescue. He later was in the bomber group that raided locomotive works at Lille, France, in 1942. He and his crew flew 72 missions, usually as the lead plane, targeting ball-bearing plants, submarine pens, shipbuilding works, a foundry and aircraft factories, without losing a plane or a crewman. A tour of duty was considered complete at 25 missions. In the early 1960s, he flew "Looking Glass" missions, which ensured that if the Strategic Air Command was destroyed, there was always a military plane aloft that would serve as a nuclear command post. He retired with 8,000 hours of flight time in B-17 Flying Fortresses and more than 10,000 hours of total flight time. Among his awards were the Silver Star, Legion of Merit, Distinguished Flying Cross and Air Medal. He retired to Alexandria in 1968 and operated a car rental business in the early 1970s. Later, he was a real estate investor and landlord for area commercial and rental properties. General Rader was born in Wheeling, West Virginia, and enrolled in a pilot training program at the old Wittenberg College in Ohio. He left college to enlist in the Army Air Corps. He later completed the requirements at the University of Maryland for a degree in military science. He was a graduate of the Air War College. Survivors include his wife of 57 years, Stephanie C. Rader, of Alexandria, and a sister. On Wednesday, November 5, 2003 of Alexandria, Virginia. Survived by his wife, Major Stephanie C. Rader, USAF (retired); sister, Eileen Schuler of Fort Myers, Florida; numerous nieces and nephews. A Mass of Christian Burial will be offered at 10:45 a.m. on Tuesday, January 6, 2004 at Fort Myer Chapel. Interment will follow with Full Military Honors at Arlington National Cemetery. In lieu of flowers, memorial contributions may be made in his name to The Mighty 8th Air Force Museum, PO Box 1992, Savannah, GA 31402. Brigadier General William S. Rader returned to Vandenberg Air Force Base, California, January 20, 1965, to become the Deputy Commander of Strategic Air Command's 1st Strategic Aerospace Division. He had previously served there as the commander of the 704th Strategic Missile Wing (Atlas), and for a brief period, as deputy commander, 1st Missile Division, before departing for Francis E. Warren Air Force Base, Wyoming, in July 1959. At F.E. Warren Air Force Base, General Rader commanded the 13th Strategic Missile Division. General and Mrs. Rader first came to Vandenberg Air Force Base (then known as Cooke Air Force Base) in the summer of 1957. The 704th was a unit of the Air Research and Development Command at that time. A native of Wheeling, West Virginia, General Rader entered the Army Air Corps in November 1940, as an Aviation Cadet. Later, as a B-17 aircraft commander in 1942, he completed 17 sorties during the Battle of Midway. On one mission over the Pacific, which lasted more than 17 hours, his aircraft was so badly damaged by Japanese guns it was unable to complete the return to Hawaii. For nearly 20 hours, the genera1 floated in the water supported only by a life jacket before being sighted by another B-17. As flight commander of the 368th Bomb Squadron in England later in the war, General Rader made one of the first deep penetration, daylight raids over Europe. He took his unit, unescorted by the shorter range fighters, to a point more than 200 miles southeast of Paris. Despite heavy enemy fire, which knocked out two of his aircraft's engines and the manual elevator controls, he bombed the primary target and made it back to England on automatic pilot. For this, General Rader was awarded the Silver Star on August 26, 1943. The general also led the Eighth Bomber Command's first division of B-17s that month against the ball bearing plants of Schweinfurt, in one of the most historic missions of the war in Europe. He has studied at Wittenberg University, Springfield, Ohio, and at the University of Maryland, College Park, where he completed requirements for a degree in military science. A graduate of the Air War College, General Rader has held many assignments which include deputy commander, 7th Bomb Wing; air operations officer with the Joint Task Force on Eniwetok; chief of the Tech Training Division, Headquarters U.S. Air Force; assistant for Operational Readiness Division, and chief for Plans and Policies, Headquarters ARDC; and, prior to his assignment to Cooke Air Force Base, he served as inspector general, Headquarters ARDC. His work with the Air Research and Development Command earned for him the Legion of Merit, awarded for leadership and management of the Plans and Policies Office there.